Toronto, Ontario  In an exciting conclusion to the 2003 Canadian Young Horse Jumper Development Series, the prestigious Royal Horse Show in Toronto, ON, showcased the National Championships for Five and Six-Year-Olds. Held Monday evening, November 10, fifteen invited entries contested the $10,000 Six-Year-Old National Championship in the newly constructed Ricoh Coliseum. Seven were able to master the first round course set by Canadas own David Ballard of Hornby, ON. Skillfully guided by Canadian Olympian Beth Underhill, Mystical Sprite posted the fastest clear round in the jump-off clocking in with a time of 32.17 seconds. Underhill was more than three seconds faster than her nearest competitor, Margie Gayford, who stopped the timers at 35.93 seconds riding South Wind. The only Irish-bred competing in the Young Horse Jumper Development Series, Mystical Sprite is a registered Irish Sport Horse by Puissance and out of a Clover Hill dam. Finishing in second place, South Wind is a Canadian Warmblood gelding by the Oldenburg sire Bajazzo. Owned by Liz Gayford and bred in Alberta by Chris Gould of Touchstone Farm, South Wind was crowned the National Champion of the Five-Year-Old Division at the 2002 Royal Horse Show. Michael Grinyer of Campbellville, ON, was the only other rider to post double clear rounds riding his Canadian Sport Horse mare, Rios Roxanne, who also successfully competed in the Canadian Young Horse Jumper Development Series as a Five-Year-Old. Bred by Augustin Walch of W. Charlot Farms, Rios Roxanne is by the Hannoverian sire, Rio Grande, and out of a Canadian Sport Horse mare, Sonnett. Two-time Canadian Olympian Jay Hayes of Cheltenham, ON, had the fastest four fault round in the jump-off riding Leonidas, a Hannoverian gelding by Libero H, for owner Trish Crang. Erynn Ballard of Hornby, ON, rounded out the top five on Charles Ormstons Rio Riot, a Canadian Warmblood gelding who joins Rios Roxanne as the second horse in the top five to be sired by the Canadian-owned Hannoverian stallion, Rio Grande. Easily taking top honours in the $10,000 Five-Year-Old National Championship on Saturday, November 8, was the Mill Creek Stables entry of Kaiser de le Cour. The handsome selle francais stallion has dominated the Five-Year-Old Division throughout the season and was named the Ontario Champion in September. Ridden by Simon McCarthy, Kaiser de le Cour put in an effortless clear round for a perfect score of 50, then received an incredibly high style score of 43.5 from judges Jonathon Millar and Sydney Olympian John Pearce to bring his total to 93.5 points. Sparky, another Mill Creek Stables entry ridden by McCarthy, finished third with a score of 86 points. Bred in Normandy, France, Kaiser de le Cour is by the Narcos II son, Verdi, and recently won the Canadian Warmblood Horse Breeders Association (CWHBA) stallion licensing in Ontario. Meanwhile, Sparky is a Hannoverian gelding by Skorpio bred by Augustin Walch of W. Charlot Farms in Stratford, ON. Finishing second in the Five-Year-Old Division with 89 points was P-Spice ridden by Margie Gayford for breeders and owners Jens and Natalie Hansen of Kanata, ON. P-Spice is a registered Canadian Warmblood mare by the famous Dutch Warmblood stallion, Voltaire, and out of the selle francais mare, Oh Ma Belle. 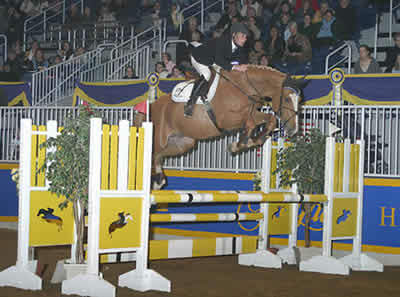 Lauren Hayes of Cheltenham, ON, guided Sheffield, a Dutch Warmblood gelding by Jet Set D, to a fourth place finish for Iron Horse Farm with a total of 85 points while yet another Canadian Olympian, Hugh Graham, placed fifth with 83 points riding Celebrity 3E for King Ridge Stables. A Canadian Sport Horse gelding by Rio Grande, Celebrity 3E was bred by Epstein Equestrian Enterprises. In addition to the competition itself, the Royal Horse Show offered an opportunity for riders, owners, breeders, supporters and sponsors of the Canadian Young Horse Jumper Development Series to mingle and enjoy the atmosphere at Canadas longest running international horse show. The Canadian Young Horse Jumper Development Series was created to encourage the development of young show jumping talent and to give Canadian breeders additional incentives to breed superior show jumper prospects. Competing on a level playing field, the horses are divided according to age and jump at a level suited to their development as four, five or six year olds. This careful development allows the young horses to gain valuable experience and advance to the higher levels of show jumping competition with confidence. Canadian breeders are recognized for their contribution to the development of Canadian show jumping through Breeders Awards. Throughout the season, breeders of the top three Canadian horses placing in the top ten in the Five and Six-Year-Old Divisions receive awards in the amounts of $250, $150 and $100. At the National Championships at the Royal Horse Show, Breeder Awards are distributed to the top three horses placing in the top ten in the amounts of $1,000, $600 and $400. Proud supporters of the Canadian Young Horse Jumper Development Series include Amerigo Saddles, Canadian Sport Horse Association, Canterbrooke Farms, Cavalier, Dave Hopps, Dr. Alan Manning, Gary Cooper Chev Olds, Grande Farms, Henry Equestrian Insurance Brokers Ltd., KingRidge Stables, Michael Grinyer Stables, Mill Creek Farms, Mill Creek Stables, Peter Miller  Scotia McLeod, Omega Alpha Pharmaceuticals, Purina Feeds, TD Canada Trust, Turtle Jack Grill House restaurants, Twin City Dry Storage and W. Charlot Farms.